The pint sized T-Cross from Volkswagen is sure to be an instant hit. 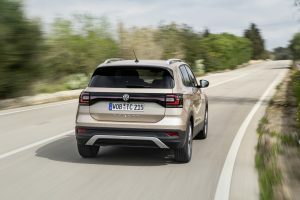 The solid looking five door is built in Spain on the VW Polo’s MQB underpinnings and its exterior SUV styling is bang on the money and what buyers are currently demanding. 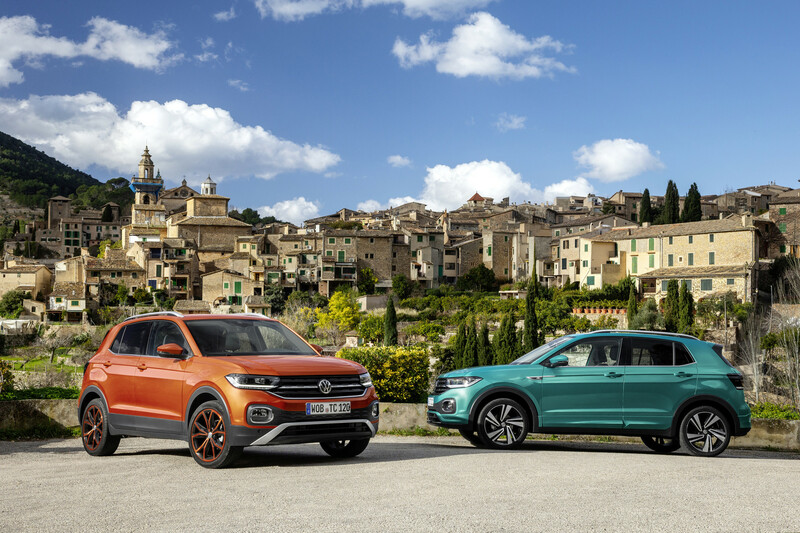 Volkswagen has loads of SUVs in its stable from the big Touareg down, but until now the brand has lacked an early twenties starting point in Ireland. 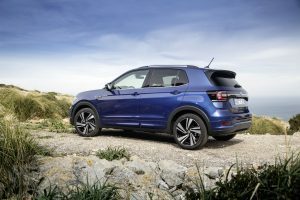 Starting from €22,495 the T-Cross gets everyone’s attention despite the one you actually being priced more in the mid-twenties. 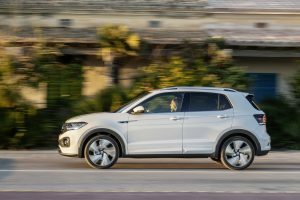 Still the front wheel drive car and spiritual successor to the poor selling VW Polo Cross remains substantially cheaper than the T-Roc. 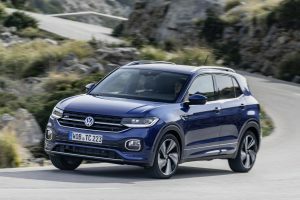 Size-wise The T-Cross slots in between Polo and T-Roc, its footprint is small but its tall styling makes it look substantial. 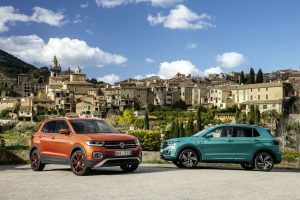 Rivals for the new VW include the big selling Dacia Duster, Renault Captur and Hyundai Kona plus there is a fleet of other well priced offerings out there like the Peugeot 2008, Seat Arona, Kia Stonic etc. etc. The T-Cross is truer to the chunky SUV stance rather than the sleeker SUV crossover styling of its bigger sibling the T-Roc. The T-Cross sits higher off the ground than the Polo and with its rugged styling looks very inch a sturdy car. Inside, the cabin is well put together with a clear and simple layout that feels familiar. Yes you don’t ave to look too far to find hard plastics that are indicative of the supermini class but for the money it is a very nice place to be. As you’d expect you can customise the trim material and dashboard to suit your mood or to imply to others you’re great fun! Depending on grade you can also adjust ambient cabin lighting. The seating is great for the class as is headroom and the all around visibility for the driver is class leading. The rear bench is set a little higher than the front two seats and this makes visibility and access great for passengers of all sizes. 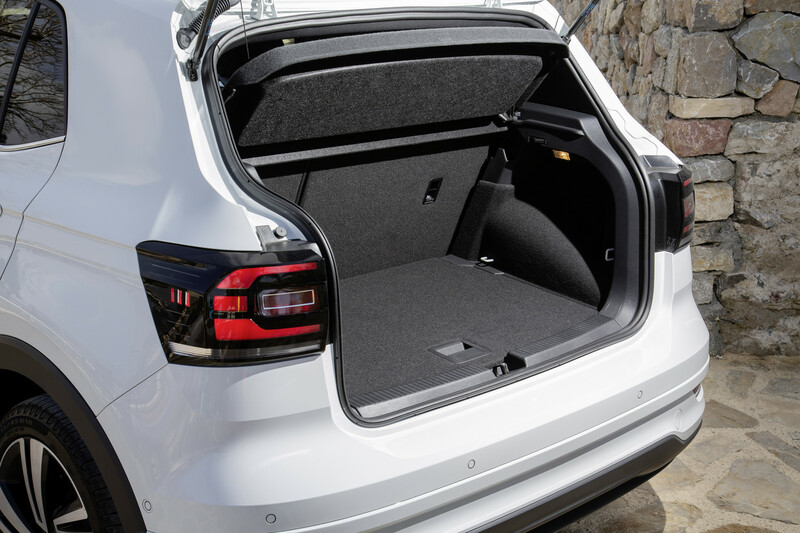 The 385 litre boot is big too and can expand up to 455 litres courtesy of a sliding rear bench. Access to the cabin is very good – and its surprising what a little rise in height can do to aid hoping in and out. While T-Cross advertising is pitching heavily towards the obvious beach ball throwing, ridiculously white toothed youth – this car’s ease of use will definitely work for older drivers too. The grade structure for Ireland is T-Cross, Life, Style and R Line. 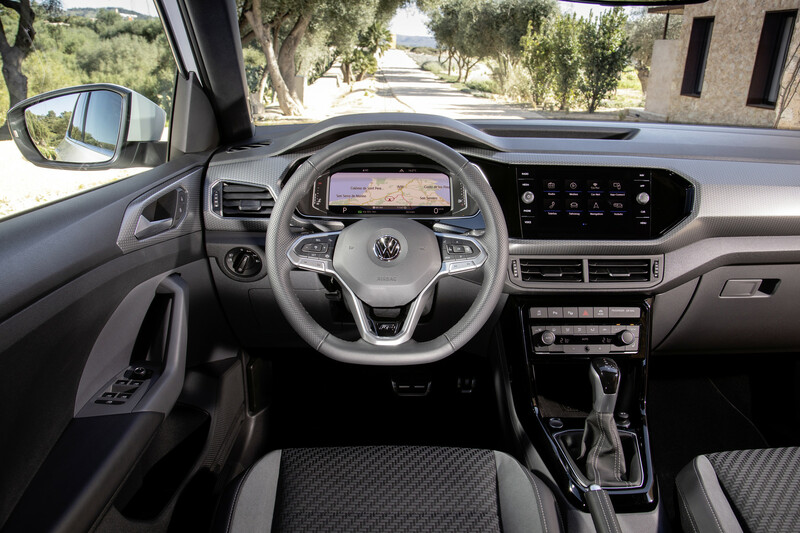 VW has some well priced value packs including the design and winter packs and the technology upgrade adds some pretty useful equipment like auto lights, park distance control, auto wipers etc. Power comes from petrol and diesels but petrol rules in this compact sector. Not this, but the next generation platform will allow for electrified versions. The four cylinder 115hp diesel coming to Ireland will work very well for high mileage commuters. We tested the 95hp diesel and it was frugal but dull, very dull. The low power 1.6 litre diesel even had the brightest of interior customisations fitted but if anything that just made the experience worse! For now the petrol 1 litre is the way to go for urban use – its a happy engine. Two TSI petrols are available with a relatively high powered 150hp version with cylinder on demand technology coming later. A five-speed manual 95hp is the entry point. This unit does its job well enough and motorways did not frighten the little engine. For a few quid more you can get a more powerful 115hp TSI with an extra gear in the manual or the option of a 7-speed DSG automatic. On the road the ride is polished for a compact machine. The car is relatively hushed when cruising too and the overall refinement level dare I say puts the new T-Cross at the top of its class. The new Volkswagen T-Cross hits the spot.